Jouluppuki (Santa Claus) is coming to town, and adults in Finland warm their bodies and hearts with Christmas markets, lights in the streets and some hot beverages. We will talk about one of these beverages today: the Glögi. 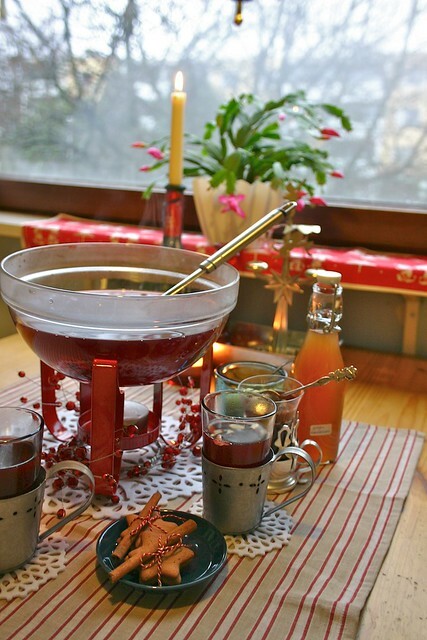 Glögi is one of the traditions of Finnish Christmas. It is an unknown beverage in Southern Europe (Hot wine? With spices? Nobody ever dared to think of it), but in Central and Northern Europe mulled wine is a classic winter beverage: each country has its own version of it . Glögi is its Finnish name, and as the headline revealed it is made from hot red wine and different spices such as cinnamon, sugar and clove. The Scandinavian and Nordic  versions sometimes add almonds and raisins, which give their version of the mulled wine a nice finish: when the beverage is gone, you can have a nice bite with the same flavor and a bit of nuttiness. The German version, arguably the most well known, is called Glüwein and is served at all hours in the Christmas markets that flood the cities and are full all day. So, when I ordered some and asked them why the name wasn’t Glögi, they looked at me in a strange way and told me that no, it was just called Glüwein. That is how I had the idea for this post. My first time with this beverage in Finland was in the house of a Finnish friend. He was preparing it in a big pot on the stove. The first time, I didn’t like it very much, as it was such an unusual taste for me; but in the end its taste grew on me. That wasn’t the last time I drank Glögi, though. It is available in every Christmas market and every bar. If it is not too cold, many places have outside kiosks that sell it “to go” as well, so every year I get one or two cups to join the Christmas spirit. There is also a version that I favour, the one that has a bit of rum in it. Heat it all up – don’t cook it though – and have a nice pot of Glögi. Let us know your tricks for it on the comments, and we can all try different variations this Christmas time.